"Salon Orchestra Hannover Gramophons" was founded in 1994 - initially under the name "Ensemble des Fleurs" from members of the two major performing Orchestras in Hannover (State Philharmonic Orchestra and NDR-Radio- Philharmonic ) as well as graduates of the Musikhochschule in Hannover. The aim of the ensemble is the maintenance of salon music and hits respectively. the dance music of the first half of last century chamber music level. 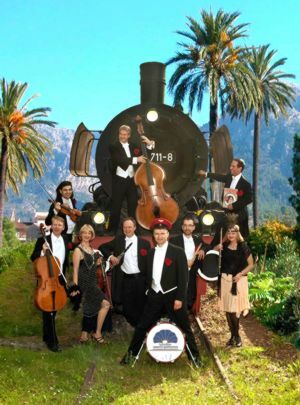 The ensemble offers concerts, but also occurred at exclusive events such as the artists ball at Opera Hannover festivals , at Lower Saxony Polo Club, Expo 2000, Wolfenbüttel Theaterball, including Hanover Press Ball, event at world championship of football in Berlin 2006 and others. The ensemble's repertoire is very varied and extensive. It ranges from classical pieces of Mozart and Beethoven on opera and Concertpotpourri, from Johann Strauss up to salon pieces from the great times of ocean liners, hits and dance music from the 20s / 30s to songs of the 50s / 60s (about 500 titles) . This kind of music will dress up any event (even visually, with costumes and decorations) and would add an elegant atmosphere as of the Golden Twenties, or reminiscent to 1st class lounges of the transatlantic liners.